My very first foray into computer games was Duck Hunt on the NES way back in the distant fog of time, now fast forward and I am fully grown married 2 kids with a hobby shelf that is threatening to need its own mortgage, so along comes a little game that brings all those early memories of an earlier simpler time flooding back. 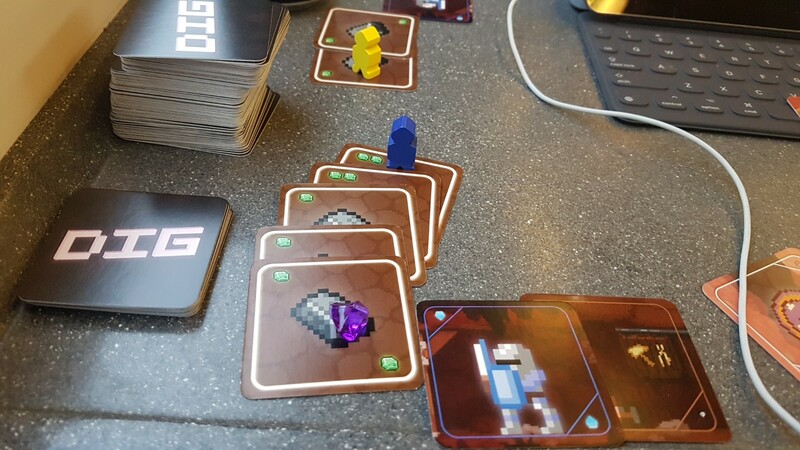 Dig is a card based game with a few meeples and a big pile of Gems to mine. At its basics it’s incredibly simple to play, and I think the age limit could have been lowered a little bit, but thats neither here nor there. You play by drawing a card of the ‘HILL’ this will either be some sort of resource you can collect, a bonus card or an evil monster come to ruin your day, the beauty of this game is aside from its ease of play, that all the graphics and images are in glorious high definition 8-Bit, to be fair the game would be just as good with modern art etc, but the style is just so retro, its a little hard not to appreciate it, and feel a slight wave of nostalgia, that is if your childhood encompassed some of the 1990s of course and that is coming from someone who in general dislikes the retro scene, the oldest console I own is the xBox One! 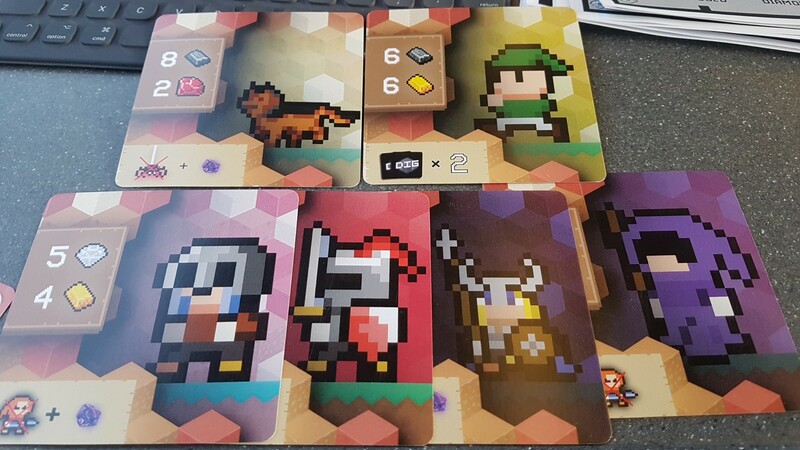 The resources you mine can be excanged in the Tavern for workers of which you can have up to 4, these workers are what start you on the way to the win condition as once you have one you can start a Gallery, a collection of resources where every 5th resource has a gem placed on it. Collect ten gems and you win, but to collect a gallery you need to find a card that allows you to close the gallery. Hidden amongst the gems and other bonuses are creatures which will steal your gems resources or eat your workers, or a massive cave which will loose you everything, well no one ever said mining was an easy job! To counter the unpleasant creatures you can hire companions these cost resources to hire, but have such powerful buffs that even the cheapest is going to be a big help, and the best part is you can hire one off each! So will this game be for everybody, probably not when I showed it to Mark he said it was a greater looking beer and pretzels game, which to be honest even after the beer would still be easy to pick up. There are plenty of stretch goals left to go on the campaign at the moment and when asked for my first impressions by the guys behind it, I told them quite truthfully that its a nice quick and fun game, I have some reservations but at this point but it is important to note that I am using essentially reviewing a prototype of the game, the card stock on the helpers is a bit lacking, and trying to remember who has hired which helper is a definite downer, but both those are in hand for the retail/kickstarter release which is great news. 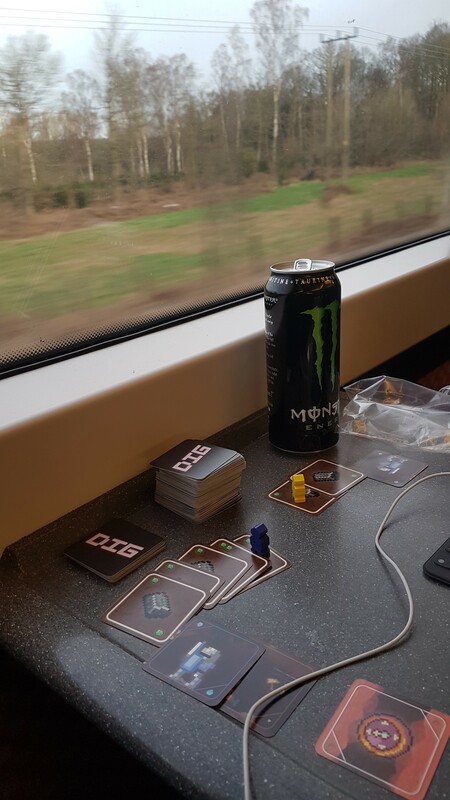 As you can see Dig can be played just about everywhere but be careful if your playing by yourself learning the rules on a packed commuter trains you may get the odd funny look.